I am really bad at titles! Thus when I come up with a decent title, I milk it for all it’s worth. For instance, my Against books--Against the Wind and eleven others. Then the Into Trilogy. Now my Texas Trilogy, Beyond Reason, Beyond Danger and Beyond Control. See what I mean? Do you have any input in the cover design of your novel? No. Sadly. I’ve gotten very little input over the years. A few times I’ve asked for changes and gotten them. Not often. If your novel was made into a movie, who would you cast as the hero? At the moment, I’m pretty high on Chris Hemsworth. He is such a hunk. A good actor, too, which is nice. Europe has always been my dream vacation. Paris is the absolute best. Unfortunately, there is a terrorist warning out against traveling there at the moment. Very sad. I’d go back to Alaska in a heartbeat. Bestselling author Kat Martin is a graduate of the University of California at Santa Barbara where she majored in Anthropology and also studied History. Currently residing with her Western-author husband, L. J. Martin, in Missoula, Montana, Kat has written sixty eight Historical and Contemporary Romantic Suspense novels. More than sixteen million copies of her books are in print and she has been published in twenty foreign countries. Her last novel, INTO THE FIRESTORM, took the #7 spot on the New York Times Bestseller list. This will be the 15th novel in a row to be included on that prestigious list. Kat is currently at work on her next Romantic Suspense. 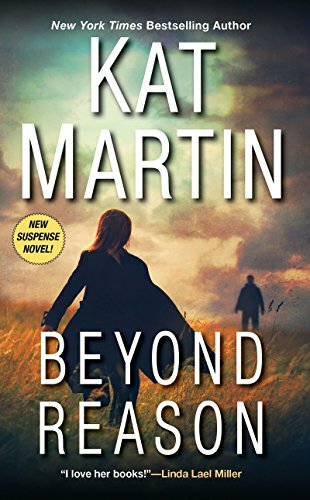 To CELEBRATE the release of BEYOND REASON, enter my new contest for a chance to win a KINDLE FIRE 7" Display, Wi-Fi, 8 GB and a Kindle copy of AGAINST THE WILD, AGAINST THE SKY and AGAINST THE TIDE. Contest runs from May 1, 2017 through June 30, 2017.